Sara Lindquist ’18 began recording her six-track EP ,“It’s A Good Day for a Good Day,” during her senior year of high school. Sara Lindquist ’18 first discovered her love for singing after joining a community girls’ choir. While the group sang, dance and acted, Lindquist realized that she enjoyed the singing component most, especially the storytelling aspect of it. “The most captivating thing about singing is to be able to take a song and be able to fully connect with the song and your audience by sharing that song,” Lindquist said. She continued to participate in the choir throughout high school, when her choir director connected to a local businessman in the recording business. This contact gave Lindquist the opportunity to travel to Nashville, Tennessee to record covers. In her senior year of high school, she began recording her six-track EP, “It’s a Good Day for a Good Day.” It was released in 2015 on Spotify and iTunes after two series of recording sessions. While she said studio work can be strenuous and often trying, Lindquist found the experience incredibly rewarding and exciting. Spending the entire day in the studio, Lindquist said that her favorite and most challenging part of recording was improving with each take. To decide which songs would be featured on her EP, Lindquist went through a long process of song selection, choosing from many pieces of original music that the studio owned. “I got to listen to the lyrics and take the time to sit with them and see if they were genuine to who I am,” Lindquist said. Lindquist said that the goal of her music is to embody positive and upbeat attitudes about life, with an emphasis on girl power as well. Lindquist’s favorite song on her EP is “I’m There” because of the message it sends to the audience. At the College, Lindquist is a member of the all-female a cappella group the Dartmouth Decibelles, as well as the varsity volleyball team. Although her schedule is packed, Lindquist said that she likes having a full schedule. Through the volleyball team, she is able to be competitive in sports, and through her involvement with the Decibelles, she is able to express herself with her musical side. “It’s really made my Dartmouth experience really full and dynamic,” Lindquist said. Gilad Doron, head coach of the volleyball team, noted how Lindquist has frequently brought the Decibelles to volleyball games to sing the national anthem. “It’s great that she is able to do all these things and still maintain a very high level of playing [volleyball],” Doron said. Though her schedule is hectic, Lindquist is fully committed to each activity she is involved in. Stephanie Everett ’19, a fellow member of the Decibelles, said that although Lindquist does not read music, she learns her parts quickly and with ease. She also said that the Decibelles often listen to Lindquist’s album. “We’re all pretty obsessed with her … she’s just such a warm person and has a great personality, and it really translates into her music,” Everett said. Lindquist’s personality and values shine through in other venues as well. 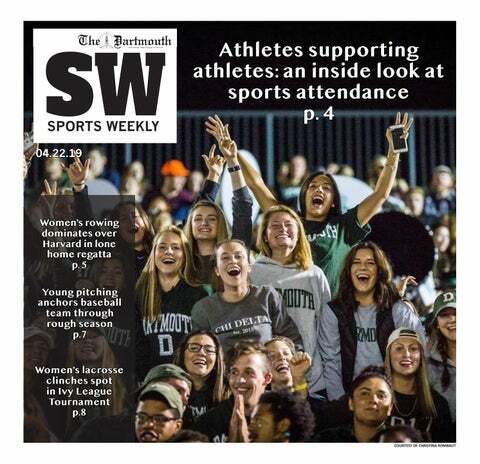 “I really look up to her and she’s just a really kind, warm person,” said Morgan Waterman ’18, a former Dartmouth teammate who also met Lindquist in high school through a summer camp. On the court, Doron said that Lindquist serves as a source of motivation for the team. “She has a very positive and accepting personality which makes the other players feel very comfortable,” Doron said. After graduation, Lindquist intends to pursue music in some form. While she has other passions and academic pursuits, Lindquist stated that her love of music and the power it has as a means of self-expression and connection with others is something she does not want to give up. “I definitely want to pursue music in some way, whether it be moving to Nashville for a few years or doing studio work for a bit,” Lindquist said.